Leslie. I had a group of girlfriends that were fun to hang out with, but Leslie was special. We kept in touch even after I moved. Seeing a couple of unexpected acts of kindness between my kids. Everyone we know tells us what great kids we have, and they are – but they’re typical siblings who get on each other’s nerves, too. Last week T-man showed genuine compassion for Bear when she was in pain, and he offered to put away her lunch groceries when she forgot. Bear offered to make waffles for T-man, and she gave him space when he had a friend over. Seeing them treat each other with kind consideration was inspiring. 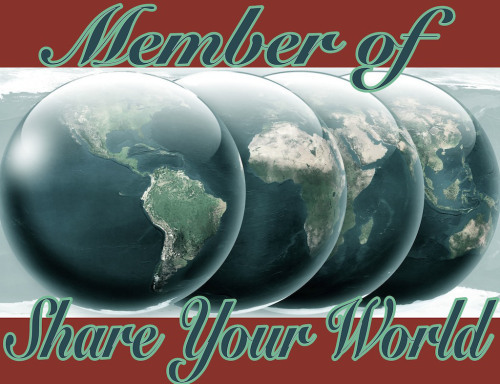 Cee’s Share Your World is a Monday feature. Check out her blog. Oh, a perfect day… Right now it would be to sleep in, stay in PJs all day with Mitchell, have Chinese take out delivered, and Ice Cream and berries ready for anytime all day. After I had that time for a few days to recoup (we are working non-stop right now) I’d say wandering a beach… With Mitchell… and if life were perfect, we’d have our long departed dogs back to walk with us. Your perfect day sounds delightful! 🙂 Oh, I wouldn’t mind that kind of perfect day either. But your SYW sounds lovely. Your perfect day sounds PERFECT! I want one, too! 🙂 Specially that carline business. Do you do it all the time? I drive them to a lot, but I almost never collect them from. Moo asked me to pick her up Friday and I bout lost my mind! lol We literally could have walked home faster, and even crossing the big bridge on foot would have felt less perilous than the carline! Phew! Ah. Well I’ve had TERRIBLE experiences with the buses here. I’d never had such rotten wait times and inconsistencies. We also live mere minutes from the schools! So I’m a dropper-offer. I am aware of some inappropriate behavior on elementary buses, but in a strange turn of events, the middle school and high school bus seems kosher.